We’re still awash in the announcement and impending arrival of iOS 5. Though it’s still in beta testing and will likely undergo a few more tweaks before its official launch, the upgrade has users fairly impressed. There’s no doubt that Apple took some liberties by borrowing features from competitors and putting an iOS spin on them, and there are some foreseeable iCloud hiccups that will need to be smoothed out, but iOS 5 promises to be one of the most significant firmware upgrades for the iPhone to date. The iOS-Twitter integration is easily one of the most significant of the changes coming to your mobile Apple devices. In addition to giving it a more “social experience” (which is what platforms like to say when they piggyback on someone else’s established social network rather than invest in or create their own), the partnership likely has some deeper implications. While Twitter is clearly the number one social resource when it comes to the iPhone, iOS 5 isn’t completely ignoring the other big players. 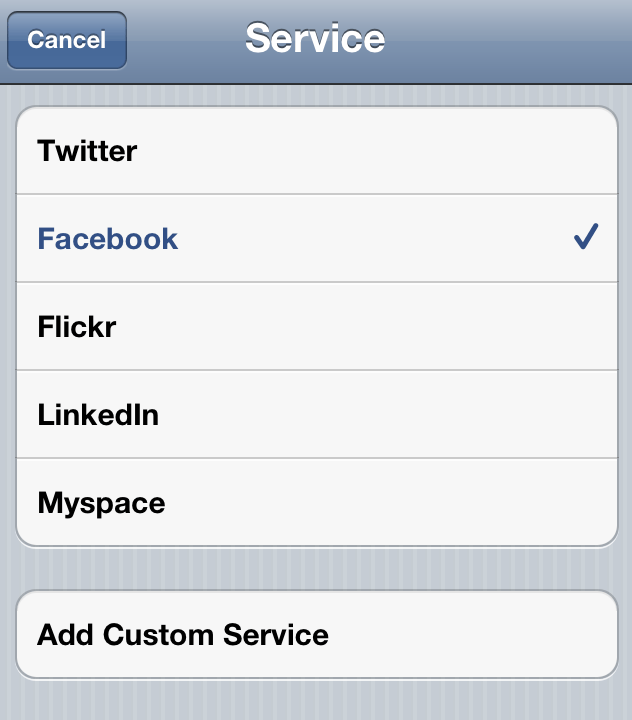 An anonymous developer testing the beta version of iOS 5 tells AllThingsD that there is an option in the address book to pull information from your contacts’ Facebook, Flickr, LinkedIn, and (in a surprising twist) MySpace profiles. We recently questioned why Apple would choose to most publicly and deeply integrate with Twitter over Facebook. There are a few distinct possibilities as to why: Two highly influential companies unwilling to cede control, past business squabbles, Facebook’s mobile ambitions, or all of the above. Whatever the reason, Facebook is not the social sign-in of choice for iOS. But despite any reservations, even Apple can’t ignore the social networking titan. You will be able to add a link to your friends’ various accounts, including Facebook, along with their email addresses, phone number, and other contact information. The caveat is that you have to enter this information manually, and not all the glitches are completely worked out. Still, this is the earliest developer beta release and such details are sure to be ironed out. The mild incorporation of its platform isn’t like to satisfy Facebook Connect, which would benefit largely from the type of integration Twitter will enjoy, but at least consumers will be able to make use of some of their social graph.